What is the order of Slab Hammer and Sword of the Animist? Which happens first in a case of a creature having multiple instances of "Whenever this creature attacks, X happens." Bisbas, I would like to add the swords in this deck, and I probably will at some point, atm, I dont have the money for them. They are to expensive for me atm. Not Sword of the Animist , but the others. Sword of the animist would be an interesting card though. Once again, thank you Gadianten, for your comment. I'll try and explain why I choose to not run the cards you mentioned. Brass Squire and especially Semblance Anvil are interesting, but I found to not be worthwhile. Although they let you play your equipment, and equip them faster, the deck doesn't need them. 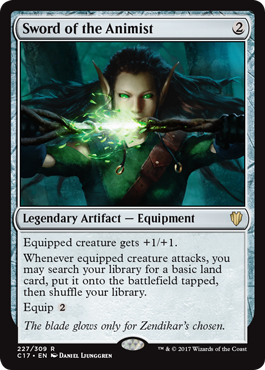 Since they are quite clunky as they are at 3CMC, and only help with half the mana cost of equipment, being that one only helps equip, the other only helps cast. As such I try and keep my mana ramp to low CMC, being 1 CMC tutors and 2 CMC Dowsing Dagger Flip and Sword of the Animist . Leonin Shikari , was in the deck for quite a while, but was consistently found to be too low impact. I'm not interested in moving most equipment around once they get onto Kemba, Kha Regent . It does work well with some equipment but proved to be not worthwhile. Emeria, The Sky Ruin , also used to be in the deck, and it was there for a really long time. It always ended up just being a bad Plains . It is a powerful card, and the opportunity cost for running it here is low. 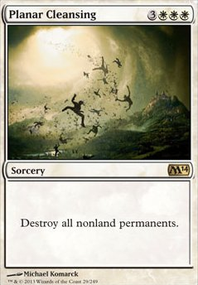 But in this deck, it isn't worth the times where you needed it to be an untapped land. Since it rarely recurs anything significant. 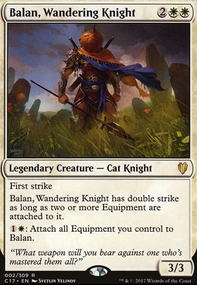 Balan, Wandering Knight does a really bad impression of Kemba, Kha Regent which I am not interested in. 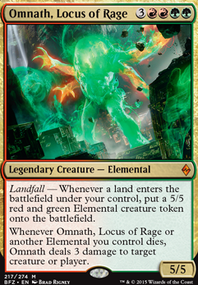 Simply put, he doesn't deal commander damage, would come up too rarely, and takes away from the focus of the deck. Enlightened Tutor would be 100% worthwhile putting into this deck. However, I only have a single copy, which is in another deck being 5C_Paradox. Thank you Gadianten for taking the time to post your comment! With regards to the cats, I understand wanting to put in lots of other cat creatures, and initially, I did. However, I wanted to make the deck as focused and competitive as possible while maintaining the same commander. Effectively changing the deck from cat tribal to instead worshipping in the glory of the best kitty Kemba, Kha Regent . To do this I cut all of the cards which are just there because they're cats. As well as some typically good but slow equipment like Batterskull , in favour of less impressive cards like Darksteel Axe . 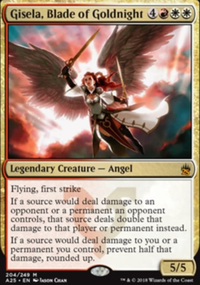 With regards to the ramp I completely understand where you are coming from, and in the decks early days this was a major struggle, and I did run 2CMC rocks like Coldsteel Heart . But back in Magic Origins when they printed Sword of the Animist , I slowly cut them all out. The addition of Dowsing Dagger Flip was also huge in Ixalan. These two cards are what all the tutors are primarily for and it makes all my tutor spells ramp spells, that can also later search for utility. 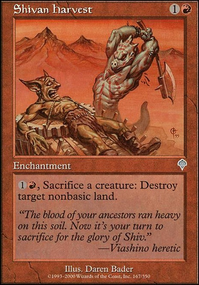 Some cards I prefer to run in Boros are Book of Rass for card draw and Sword of the Animist to get more land on the battlefield. Blinkmoth Urn is another nice source of ramp in artifact heavy decks. I'd also suggest that you do more with your description, to tell us how you want to win, what your plans for the deck are, what you feel like it needs help with, etc. It will help the rest of us to give suggestions as to which way you want the deck to go.